Facebook, and other such social networking websites, are meant to help stay in touch with friends, make new friends, play games, plan events, send virtual gifts, adopt virtual pets and do other such online activities. While all these activities are enjoyable, at times you get so used to them that you forget that you have an actual life to live. When you forget this fact and start spending more time online, thus neglecting yourself as well as people around you, it means you are suffering from Facebook addiction disorder. I think Facebook is the most crowded and addictive page in internet. I consider that the people nowadays have lost all the carnal relations for be all the time in front a computer, forgetting how to talk and only practicing how to make ridiculous and irrelevant phrases. They are not thinking and strengthen the diaries relations that they should have everyday. 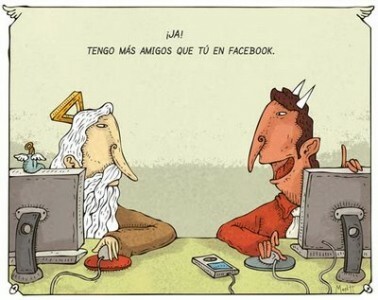 facebook! in reality that translates this word? addiction or communication? friends or enemies? happiness or sadness ?.... really is a need to feel accompanied and watched, and more than a necessity becomes an addiction that sooner or later invaded much of our lives, so much can not live without it. FACEBOOK is something that I really like, because not everything is wrong...Facebook has a lot of positive things...I can mention a few of those. 1. You can find people that you need. 2. You can contact old friends. 3. You can comunicated with people from other countries. But also,THE FACEBOOK can eats us...The first thing that we do when turn on the computer or the cellphone is log into facebook (I speak by me self and by majority of people who I know). We can spend a lot of hours in facebook watching pictures, status or gossiping....and that´s why I say that our life is virtual now, and virtual life has converted more important than the REAL LIFE that is knowing how to coexist with the other, know how they smell, how they really think, how they live. I am addicted to facebook, I lose much time, I think that should not happen,because the time is very important for hobbies or learn what we want, learning and enjoying every moment surrounded family, friends, love and every person ....The good times are short, so we have to live us happy! WE NEED LEAVE THE ADDICTION BE CONNECTED AT ANY TIME! Just see this amazing video. It talks from itself. Thanks topo I've been looking for this video a loooong time ago.. yeah it speaks for itself and I remember that the first time I saw it I was with my mum and she had her cellphone in her hands and when the video ends, she inmediately dropped the phone and started to kiss me and tell me I LOVE YOUUU! karen That the Same form, i believe That all starts with good intentions: in this case facebook began as a simple network for students of Harvard University, with the intension of people to share their tastes and feelings. but now are, facebbok is used with double intension, for example many people use it for is white, steal identity, People steals etc. I think that facebook is one more way to stun people, and causing them a stupid aficcion, having the need to know what others are doing, making people more gossipy. why I propose that people do not become addicted to facebook, that rather than get ahead of mental retardation. I like your comment moni people mistook this social network and are not giving a place in the world if not a few dependent of the facebook asking and finding out lives outside, to give you the proper use of investigate and make intelligent comments. Actually facebook has become a silly web page, now people know what it means, because its getting addictive for adolescents that only want to get in touch through this way and they have forgotten to talk personally. Even though facebook has bad things, some other can be good for us, like find people that have been out of reach. Also facebook can be useful for students to get assignments and homeworks. Facebook has a lot of good things and its good to be part of it, you just need to give facebook the right use. I wonder what they did when it didn't exist. That anyone knows where are you, how you or the others look in them profile picture or know with who you went out isn't good. Is the most stupid social network that ever invented, and if it's for works or reponsabilities, you should to know them and you have to fulfill them. What did the students when it didn't exist? Today, facebook has become a stupid network, because the people have been charged with giving its meaning, today we are experiencing a worrying addiction as teenagers just want to interact with people only by this way and talking personally had been forgotten. although it has its bad things also has its good ones, facebook allows us to return to talk to people with whom we had lost communication, anyway a number of things which make worth belonging to this network, but everything depends on the way we use it. hahahaha excellent video Caro, Clearly shows the idea generated by the facebook, problems, confusions, gossips, among others. The Facebook should be used for communication, for sharing photos with those who actually are far away, the true is that we are addicted and THAT IS NOT IDEA!! The same situation occurs with the Blackberry. My point of view about these phones is that they can be very effective and practical for the daily life, but they have become in addiction to the point that we don´t see face to face with our best friends anymore, we just send an emoticon supposedly summarizing our feelings toward these people. 1. Spend more time than you think you should navigate on facebook? 2. Think you have a problem if you reduced the time spent on facebook? 3. Their families have complained of the hours dedicated to be connected to the internet to be on facebook? 4. He finds it hard to stay away from facebook several days? 5. They resent their relations to spend many hours connected to facebook? 6. There are facebook applications areas or those who find it difficult to resist? 7. Have trouble controlling the urge to buy new applications or services offered on facebook? 8. Has tried, unsuccessfully, to reduce their use? 9. Draws much of its life pleasure from the fact of being connected to facebook? Quantify the number of positive answers. Subject: Re: WHAT IS YOUR OPINION ABOUT ADDICTION FACEBOOK?